This is part 3 of our 5-part series on improving the performance of the Spring-petclinic application. Here are part 1 and part 2. Yesterday we managed to make the application handle 5000 users, with an average performance of 867 req/sec. Let’s see if we can improve this today. Running the tests from part 2 showed us that some requests are taking a lot longer than the others, in fact our application does not answer requests fairly to all users. 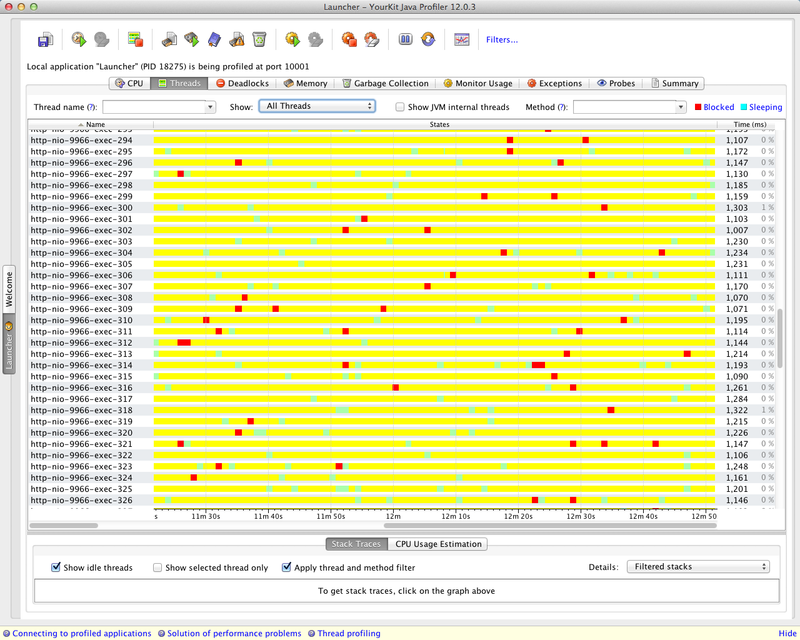 This YourKit screenshot shows a profiling session, where each time a thread is locked it becomes red. It seems we have a few locks! This explains why some requests are really slow, they are getting locked by the JVM. YourKit also shows us 3 main culprits for those locks, which we are going to remove one at a time. The first cause of those locks is our database connection pool, Commons DBCP, which is well-known for doing a lot of synchronization. On a real production system, it is very likely that a number between 30 and 100 would be a better configuration. Testing the application again, we now achieve 910 req/sec. Webjars is a library that is used to manage client-side libraries like JQuery or Twitter Bootstrap. We have included a request to get JQuery in the stress test, in fact we expected this to cause some trouble: Webjars is using the same mechanism as Richfaces to provide static resources, and we already had that exact same issue with Richfaces (by the way, many other Web frameworks, like Play!, are doing the same). Indeed, the JVM is doing a big lock each time someone tries to load a Web library. We have experienced this being an issue at a client site: we are only testing here with one Web library, but if we were using all the libraries from the application, things would be much worse. For our next steps, we have now disabled the “JS” step in our JMeter test, and have enabled the “JS no webjar” step instead. This will make our stress test use the JQuery script that is served directly by the server, without using Webjars. So let’s get down to the results: we are now at 942 req/sec. This last issue was created on purpose: we have a small lock in the aspect which is provided to monitor the application with JMX. We now reach 959 req/sec. 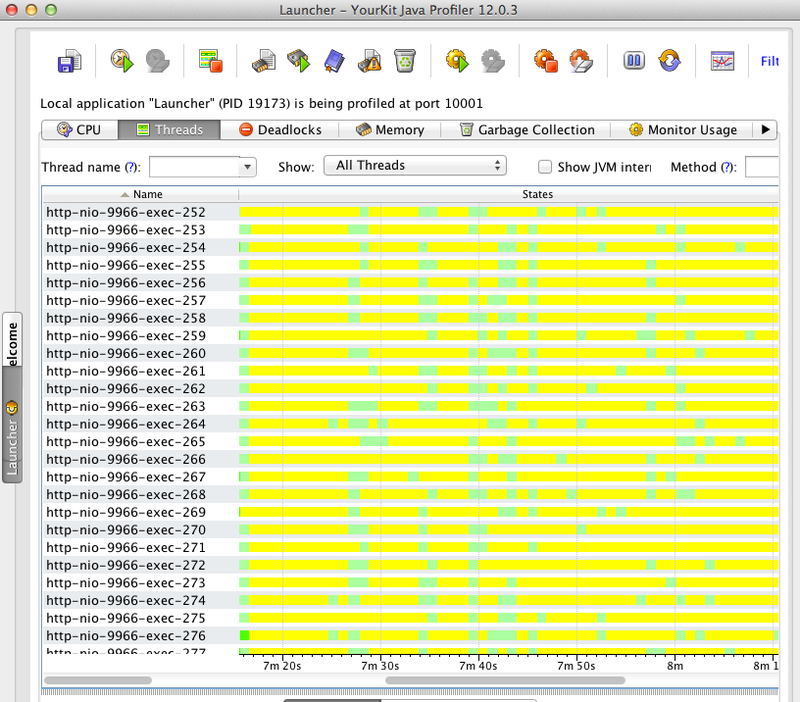 We have used our profiler to quickly see that we had some JVM locks on the application. We have removed each of them, and saw each time an increase in the performance of the application. Our application went up from 867 req/sec to 959 req/sec. This is of course a better result, and it would probably be even better on a real production server, which has more cores and threads than the Macbook we are using for the tests. On part 4, we will test if we can do better with JPA than with JDBC. You can find the other episodes of this series here : part 1, part 2, part 4 and part 5.